Miami home prices rose at a slower rate in June, according to a newly released report by CoreLogic. Home prices in the Miami-Miami Beach-Kendall metro area increased 4.4 percent year-over-year, marking the seventh-highest increase in the U.S. From May to June, home prices increased by 0.1 percent. Prices rose 6.1 percent statewide and 6.7 percent nationally. Four of the 10 biggest metros in the U.S. were overvalued in June, including Miami, according to CoreLogic. The research firm compared home prices to income levels. Markets where home prices were at least 10 percent higher than the long-term, sustainable level were considered overvalued. Affordability is “rapidly deteriorating” in those markets and across the country, Frank Martell, president and CEO of CoreLogic, said in the report. In Miami, prices have been increasing for more than 5.5 years. 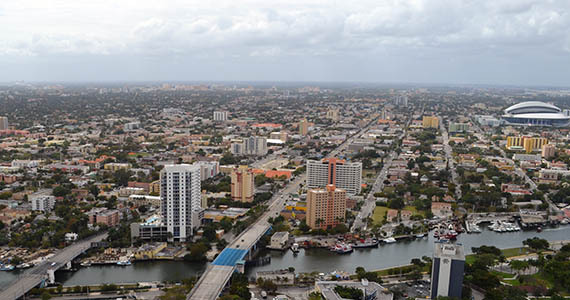 According to a recent Miami Association of Realtors report, the median price of a single-family home in Miami-Dade increased 6.3 percent in June, year-over-year, to $335,000. Condo prices were up 6.8 percent to $235,000. Denver, also an overvalued market, reported the biggest annual gains in home prices at 8.7 percent in June. Las Vegas, Los Angeles, Boston, San Francisco and Washington, D.C., followed.